A New Haircut - yikes...I have a Bob....a hairstyle I have been actively trying to avoid since I was ten. Usual pattern is to have my hair long for a few years, get bored, cut it off extremely short, have a few extremely short hairdos and then decide I want it long again. Go through the painful process of growing it out, all the while swearing that once it is long , I will Never Again cut it short. Grit my teeth and get creative with clips and headbands during the worst bit- the not short, not long but dreadfully in between stage( yes a Bob!) and finally- hit the length where I can pull it all back and start getting bored with it once more. Today, however I went to my friend's hairdresser with my just long hair and asked her what she would do if given free rein.She is very hip, very talented with the scissors and very opinionated. Rather scary actually but in a good way.She has a bright red dyed hair in a Cleopatra style do with a heavy fringe, a knack of putting vintage outfits together and more tattoos than I could count. Hence the Bob. Sort of like Victoria Beckham used to have which I'm not sure is a good thing or not. It's kind of swingy and kind of fun but most definitely a Bob. Have I mentioned that my very cute next door neighbor who is ten, has a bob? And dark hair like mine.So now we both have the same hairdo and look the same except she is ten and cute and I am most certainly not. I'm not sure if I like it. I know I don't dislike it. So tomorrow, I will wake up and feel strongly that a Bob is my Look for this season. Or I will be making another appointment to make my Bob go away. Which means of course, extremely short hair and the chance to go through the whole growing out process again. I'm still here despite the loud silence at this end of the screen. My blog.... I feel a pang every time I sit down at my computer and don't post. Which as I haven't managed to post for ages adds up to a lot of panging in this part of the world! I occasionally sneak in the time to catch up on some favourite blogs which I enjoy but further reminds me of my continued post-less status! I'm not sure when blogging became such a pressure - surely an indication that I should just officially declare a no blog zone for a while? Yet I am reluctant to admit that something which has given me so much enjoyment now seems to be too hard to squeeze in and to find the energy for. I sit to write a post and my brain says....nothing! Well at least nothing of interest. It's not that I'm doing nothing - I am - it just doesn't seem that it would be of all that much interest to anyone else. Except maybe my mum and she has to be interested! My balance seems to be totally out in the last year. I have so many things that I want or need to do that I am a little paralysed by the sheer length of the list. Which actually I am too scared to make in case I have to lock myself in a dark closet afterwards due to being overwhelmed. The creative stuff... like a Pencil in my pocket. There are two pencils sitting here looking at me reproachfully....harder than I thought! Here I was thinking it would be a nice way to get the creative juices flowing and a few nice pencils into the bargain. Hmmm, no. Anything remotely crafty - I have seemingly lost my ability to focus on projects. My usual approach was to start something , work on it, then finish it. Not lately...I have loads of ideas, so that's not an issue . I either jump right in and make a start only to get distracted and start something else or somehow lose momentum and let it fall to the wayside. Or I think about the possibilities, do a bit of research, think a bit more, plan a bit....and really do nothing with it. Onto the backburner it goes, with everything else. Seems I am having a minor/major creative crisis which I really have to resolve soon before my head explodes.Which won't be fun for anyone, I am guessing. For now though, I might be brave and make that list - perhaps it won't be as long and daunting as I imagine it to be. As for applehead...well I am going to take the advice of this girl and try posting with a limited word count and a ten minute time frame. Expect mundane, expect not to deep and thoughtful but at least expect a post every now and then! I was lucky enough to have a day wandering around Surry Hills with Damian...we were able to spend time browsing in the many design and homewears shops that are normally off limits with two small children in tow. One of my favourites was Koskela where I picked up a few early Christmas gifts- I couldn't resist the bag they came packaged in ( usually I pull out one of my own reusable ones). 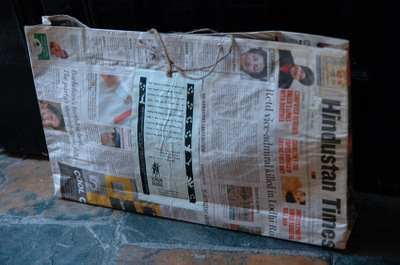 The bag is made from recycled broadsheet by young adults and village women at 'Karm Marg"- a center and initiative set up to help children and young adults living on the streets in New Delhi. This paper craft is one of the many projects used to help the center become self sustained as well as teach skills to help the children survive.The bag is surprisingly sturdy and lasted a day of being lugged around filled with bits and pieces.Every where I went it attracted attention - not bad for a bag made out of someone's discarded newspaper! By the way, if you're in Surry Hills,it's worth the effort to stop in for a quick( or not so quick) look at Koskela- inspiring homewears, textiles and furniture and warm friendly service as well. Other enjoyable places of note were David met Nicole, Planet Commonwealth and of course Chee Soon & Fitzgerald. after a year of blogging I have been tagged! Not as a thinking blog ( thank goodness, way too much pressure there!) but by the lovely Julie to do a nice simple one. I love banana cake, banana smoothies & banana Paddle Pops but I cannot bring myself to eat an actual banana - it's the texture that gets me. For the same reason I do not eat sultanas. An oyster however is an entirely different kettle of fish. Can't get enough oysters. 2. I once appeared on national daytime TV dressed as the Mrs Fields Bear ( you go, Deb!) with Kerri Anne Kennerly. 3.I can go to sleep anytime ,anywhere- a very handy trick I learned at uni. It's the waking up bit that I'm not so good at. 4. I can quite happily reread a favourite book - I'm not talking once or twice or three times. More like 50 or 60 or more....I have lost track of the times I have read Pride and Prejudice or the Lord of the Rings trilogy. Alice and Wonderland is another well worn book in my house. 5. I drink water constantly, all day, through the night - I am never without a bottle or two by my side. I think I must dehydrate easily. That or I'm just very thirsty. One of my clearest memories from kindergarten has to do with food. Pretty stock standard across the whole class except for Effie, the daughter of a Greek couple who owned the local milkbar. Twenty two pairs of eyes would be glued on her brown paper bag to see what would emerge. And more often than not , out would come the two pieces of white bread with a half a family block of Cadbury's milk chocolate sandwiched in between. 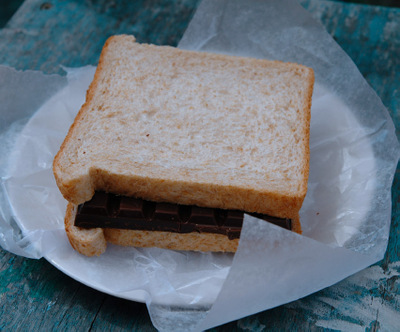 Can you imagine what the teachers would say today if you ever dared to send your child off to school with a chocolate sandwich for lunch? Maybe if you made it with wholemeal, wholegrain bread you just might get away with it! So, as a chocolate sandwich is not high on the list of nutritionally sound lunches, I have been searching around for recipes and ideas for Rose's morning tea and lunch. 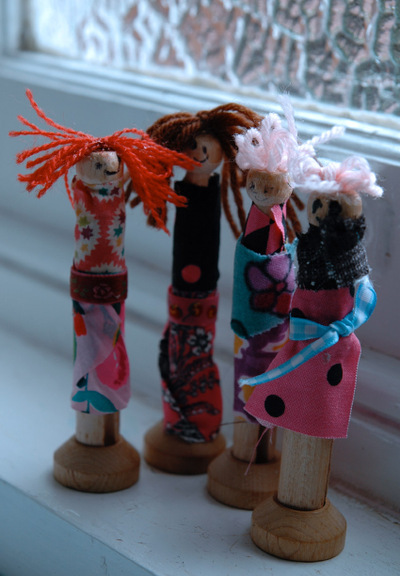 What does everyone out in craft blog land send their children off with? Any ideas would be most welcome indeed.